A couple of weeks ago I got to shoot a music video for a super talented up-and-coming artist, Nik Day. My friend, Tucker Dansie, directed. I had agreed (insisted) to shoot the video for him and then looked up Nik Day online and became an instant fan of his music. I became really excited to work with them on this project after that. We shot the video in two Saturdays. Both days were only a few hours each. 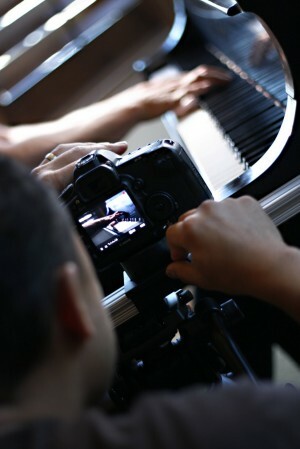 The first day, we shot the performance shots of Nik at the piano. We shot on the 5D MkII mostly with the 70-200mm and also the 24-70mm on a slider. We did one shot with the 7D but didn’t end up using it because it didn’t match the quality of the rest of the shots very well (it was a throw-away shot, anyway, so no big loss). For lighting, we used no more than two small lights at a time… if I remember correctly (this is why I’m supposed to write these blogs soon after the shoot). They were tungsten units corrected with full CTB—which I haven’t done in a while, oddly. P.S. I hate Lowell lights and always have, but since my gaffer, Chris Peck, was dealing with them, I didn’t mind so much… I guess. The following Saturday we shot the story elements with an actress for a couple hours in the city using available light and a reflector or two. On the first Saturday, there was an on-set photographer, Megan Brooke (click here to see her blog post and photos), and my wife came along and took some photos with her Hipstamatic app on her iPhone. It was a simple, fun shoot and I got to work with great people! I think it turned out pretty well. What do you think?